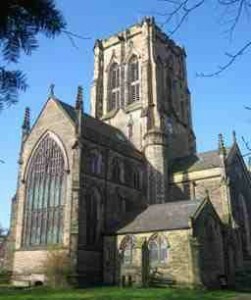 For over 160 years the bells of St Margaret’s have been at the heart of Altrincham’s soundscape. Long before the hoarse whirr of automobiles or the shrill screech of sirens, the sound of these same 10 bells lofted across fields and between homes, threading our community together. They have called our ancestors to worship and heralded the end of wars, announced the deaths of monarchs and celebrated the festivals that punctuate our lives. All peals of bells have their own unique voice. Some are musical but sterile, others plunk like a set of metal buckets, while the bells of St Margaret’s have a throaty, Victorian grandeur, time capsules singing out from 16 decades past. At St Margaret’s we are a vibrant, social band of ringers, excited about passing on bell ringing to future generations. In February 2018 we began training a youth band – a group of six, 12 to 14 year olds who are at the centre of ringing at St Margaret’s. Working in partnership with the ringers at St Mary’s in Bowdon, it is our intention to turn this into a youth ringing centre, a training centre of excellence and best practice, focussed on growing the next generation of young ringers. As such we are intending to take on a group of about four youngsters every year, so that these 10 steely voices from the past, continue to resonate far into the future. At St Margaret’s, we ring every Monday from 7 until 8pm. Sunday ringing is from 10.15 until 11am.